A national tribute to Bob Hope and the military. – Cool San Diego Sights! Bronze audience listens to a Bob Hope comedy routine. Perhaps you fondly remember Bob Hope. Millions do. I do. 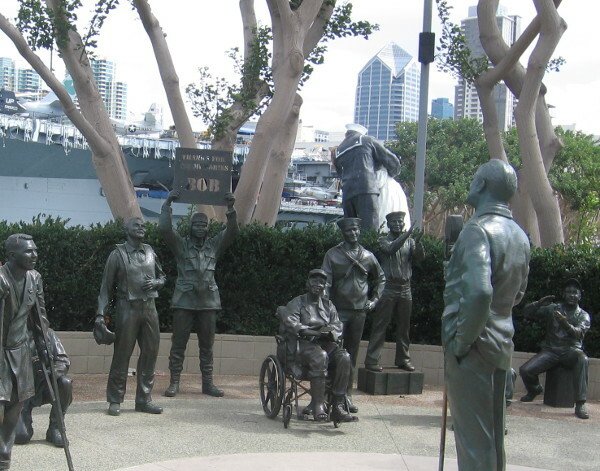 In San Diego, a fantastic tribute to the legendary comedian can be found on the Greatest Generation Walk, just south of the USS Midway Museum. 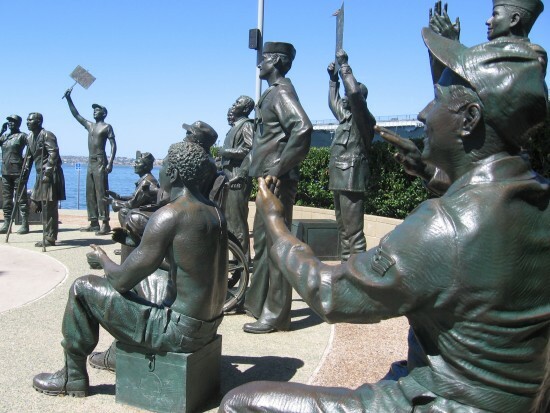 Sixteen life-sized bronze figures show Bob doing a comedy routine for assorted American service members from the Army, Navy, Air Force, Marines and Coast Guard. An outdoor speaker plays old recordings of him telling his inimitable jokes. 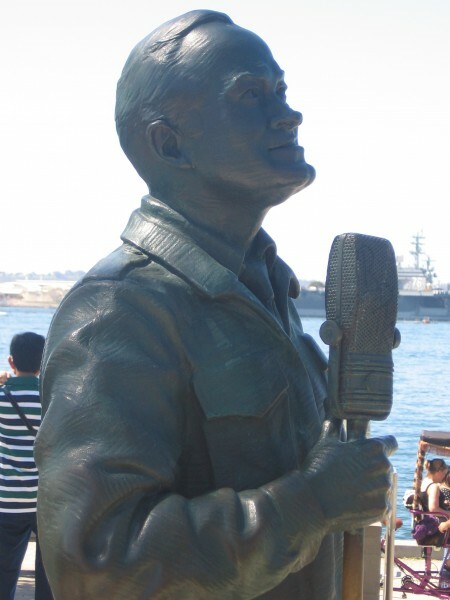 For five decades Bob Hope entertained the troops during his many USO tours. The famous profile of legendary American comedian Bob Hope. 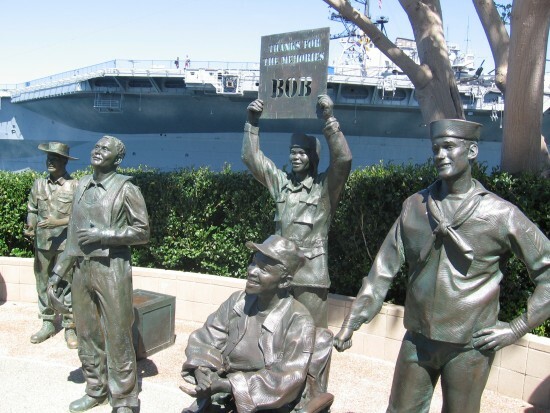 USS Midway can be seen behind the bronze service members. USO tours by Bob Hope over many decades are recalled. 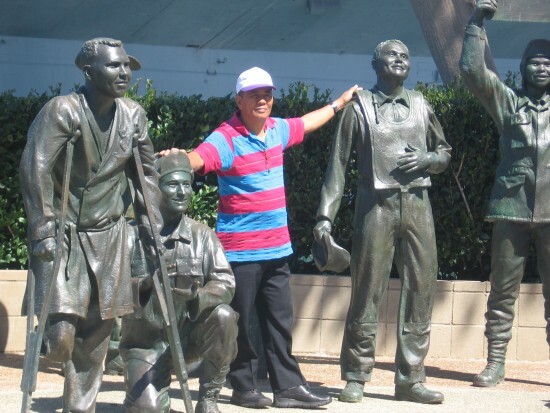 Man poses with bronze sculptures of American military heroes. 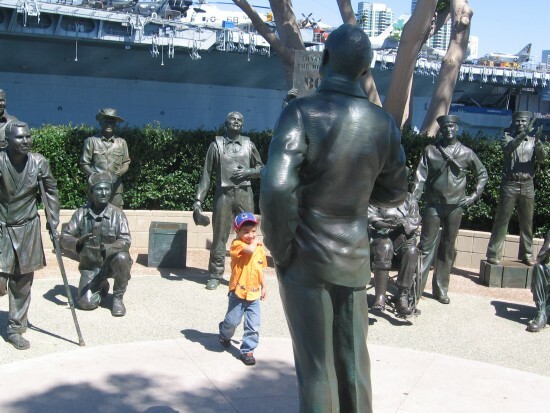 Bob Hope entertains troops by the USS Midway Museum and the Unconditional Surrender “Kiss” statue. 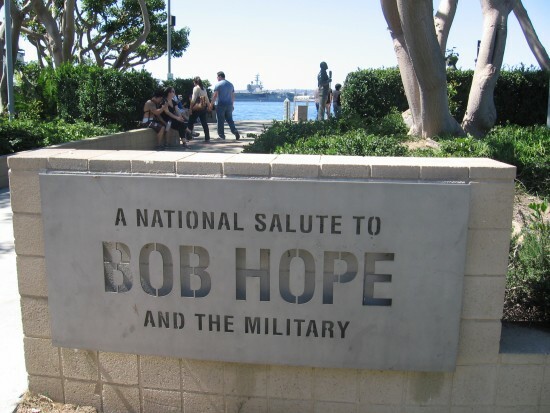 A National Salute to Bob Hope and the Military. A wonderful post and tribute to a man who sacrificed his home-life to give our fighting troops a smile. What better way to make the transition from the Korean War back to WWII than with paying a tribute to a man who went far out of his way to bring servicemen and women a smile! I agree! I remember enjoying his TV specials when I was a kid. He just made you feel good! One of the sadder aspects of live art. Once the artist stops working, he gets forgotten. Not Bob Hope! Great to see he is remembered like this – tell the kids, keep the candle burning. He was a unique talent and he should be remembered. At least today with the internet, recordings of great live art can be digitally preserved for future generations. He certainly did his part to bring cheer to places that weren’t very happy. Thanks for the memories, Bob, and thanks for another great post, gpcox. That nose and chin always gave more laughter to his jokes. It’s been a few years, but I remember watching his road movies with Bing, and various others. He provided innocent, good-natured humor that seems almost quaint today in our often mean-spirited culture. Previous Previous post: Big indoor mural at San Diego Museum of Art. Next Next post: Early morning light on buildings and water.